Despite the constantly growing dependability of storage devices, the loss of digital information remains quite commonplace. Generally, causes of data loss include hardware and software failures, sudden power cuts, software malfunctions, viruses, and human errors. Basically, it is because the button on the keyboard ‘Delete’. Most of the computer users take this to the face value and think that when you press delete button, it’s gone forever, which is not the case. Also, we have all become very used to the Windows Recycle Bin, where you can move files that you no longer want, but can get them out before you empty the bin. Many people still don’t realize that with data recovery, even when the Recycle Bin is emptied, there is still an opportunity to recover the files. Any information saved to a storage device is luckily almost always recoverable. Deleting the files and folders by mistake is a fact of life for anyone who uses a computer. The following article describes most common data loss situations and ways of handling them. Recovers permanently deleted files in Windows versions after shift deleted or emptying the recycle bin. Recognize and preserve long file names when restoring files & folders. Restore files from a formatted partition, drive, and card. Data recovery from raw or inaccessible hard drive caused by format error is included. Recover data from lost partitions due to re-partition, boot manager, improper clone, system re-installation, disk accident etc. It also supports data recovery after a system crash, hard drive error or failure, virus attack, unexpected power off, etc. Multi-Disk Drive Support – Performs FAT/NTFS, EXT2/EXT3 recovery on all IDE, EIDE, SCSI, and SATA disk devices. The Best Shift Deleted File Recovery Software? When it comes t the best shift deleted file recovery software, we would like to say EaseUS disk data recovery. First, it has powerful data recovery capabilities that can deep scan your entire hard disk to find and restore all your files deleted by Shift + Delete or data no longer in the Recycle Bin. Multiple types of files like Word, Excel, PowerPoint, emails, photos, music, video are all recoverable. And second, it has a wizard-like interface that can help users complete the whole shift deleted file recovery process in simple steps by themselves. You can easily download the software at EaseUS Data Recovery Wizard official website to recover your lost data. Once you downloaded it, you can easily install it without any problem in just one minute. Now, click the EaseUS Data Recovery Wizard application icon on your desktop or in start windows bar to launch the application. Step-2: Select a Location to Start Finding Data And Scan. A quick scan will start first to search for all the files lost after shift-delete on the disk. After it completed, a deep scan will automatically launch in order to find more files. After the scan, select lost files found by this tool and click ‘Recover’ button to retrieve them back. Here, you’d better save all the recovered files on a different drive or device in case of data recovery failure. The scan result interface is divided into 3 parts. At the left is the Directory Tree list. The window in the middle displays all the files and folders under the folder selected in the left window with more info (date, type, size and so on). This is the best method of restoring permanently deleted files or lost files using a software called EaseUS Data Recovery Wizard from your Windows computer or laptop. You can download the EaseUS Data Recovery Wizard here. Hope, this article helps you to restore deleted files or lost files from your system in the best way. Why not download the program and have a try? 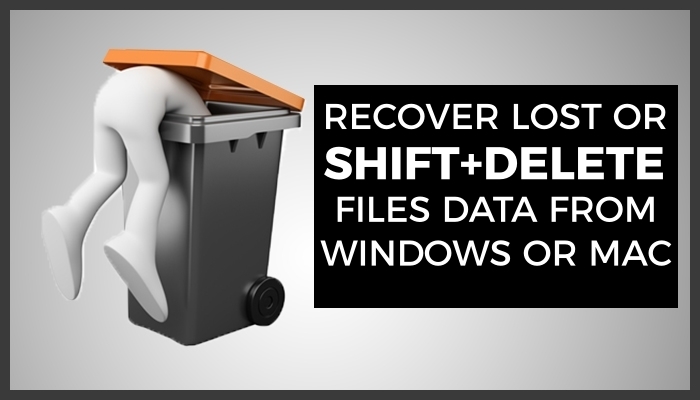 Which method do you use to recover lost data or Shift+delete’d files from your PC or Mac?